SR Real Estate Group is collaborating with some of the areas Top Real Estate Agents to host an array of open houses in prestigious Montville Twp, NJ. The area boasts some of the most beautiful, luxurious homes in Morris County and Northern NJ. With top-rated schools and easy access to freeways and fine dining & shopping, you’ll want to stop by and tour these fabulous luxury homes, designed with YOUR lifestyle in mind! 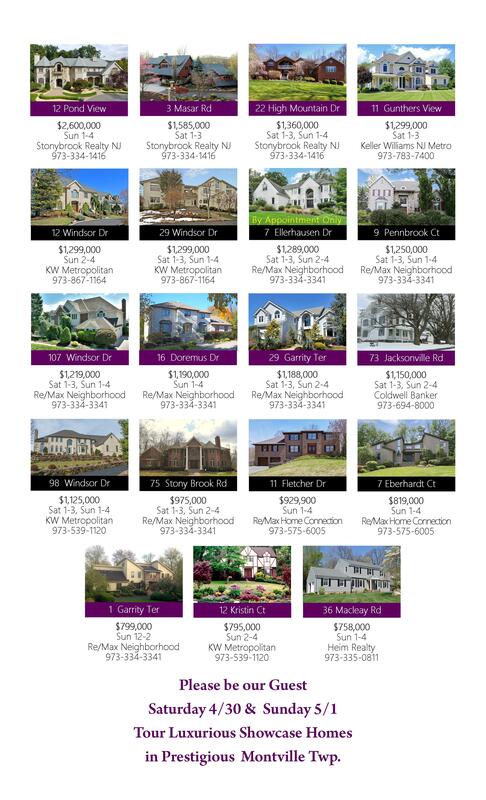 Each home will be open to the public at varying dates & times, so check the list below to see what time your dream home is available. To contact the listing agent for a specific home, the phone number for the hosting real estate office are listed below each home. You can also view more pictures and stats for each home on our website. Written by Smitha Ramchandani on April 28, 2016 . Posted in Community Events & News, Montville Twp.